What effect does controlling an avatar, while in the presence of other virtual agents, have on task performance in virtual worlds? Would the type of view have an influence on this effect? We conducted a study to observe the effects of social inhibition/facilitation traditionally seen in human-to-human interaction. The theory of social inhibition/facilitation states that the presence of others causes people to perform worse on complex tasks and better on simple tasks. Simple tasks are well-learned, easy tasks, while complex tasks require more thought processes to complete the task. Participants interacted in a virtual world through control of an avatar. Using this avatar, they completed both simple and complex math tasks in both 1st person and 3rd person views, either in the presence of another female virtual agent, male agent, or alone. 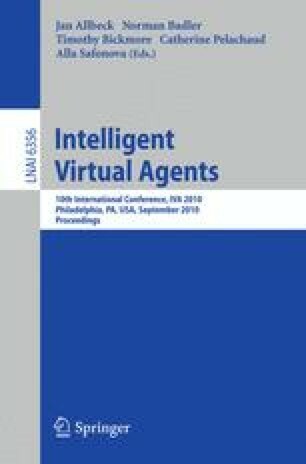 The results from this study show that gender of virtual agents has an effect on real humans’ sense of presence in the virtual world. Trends exist for inhibition and facilitation based on the gender of the agent and the view type. We have also identified several challenges in conducting experimental studies in virtual worlds. Our results may have implications on designing for education and training purposes in virtual worlds.